Flu Season is upon us! As are days of miserable kids, days off work, and tons of tissues. If you’re anything like us, you want no part of it. However, it may come to your neighborhood sooner than later, so we prepared a list of things you can do to protect yourself and your family from the flu virus this year. Be sure that you are wiping down everyday items that the whole family typically uses, such as doorknobs, phones, and remote controls with a disinfecting cleaner. This will help slow the spread of any viruses. Also, being strict about the entire family washing their hands with antibacterial soap throughout the day will help avoid spreading germs. A REME Halo light is the best way to avoid flu season altogether. The REME Halo can kill up to 99% of the germs in your home by purifying the air you breathe. This device produces a hydro-peroxide plasma that is distributed through the duct system of a home and into the living space, eliminating almost all air pollutants and most surface pollutants. It can easily be installed in your existing HVAC system, in one simple installation! 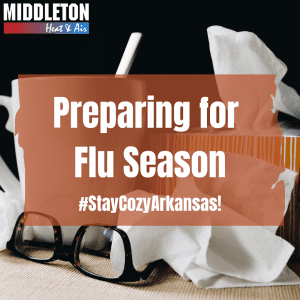 Just in case the above methods aren’t enough to keep the flu completely out of your home, there are a few things you can do now to prepare for the virus striking later. Be sure to check your medicine cabinet so you can stock up on the remedies that are typical for flu season such as fever reducers, decongestants and anything else you would typically have on hand for flu emergencies. You may also want to stock up on tissues, hand sanitizer, and paper towels. It may also be a good idea to have a prepared meal or two in the freezer in case you get sick and don’t want to cook for your entire family while you have the virus. Middleton offers REME Halo Light installation as well as seasonal maintenance in order to keep your family healthy and safe this year. To find out more about a REME Halo and/or maintenance, contact us online or by phone at 1-800-404-0371.